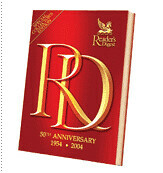 We had been Reader's Digest subscribers for many years. Dad finally acquiesced in severing the relationship when we had to abdicate Jamshedpur for KOlkata. I was already in Pune by then and dad had more pressing issues to deal with, consequential to which the subscription was never renewed. However, I remained a loyal reader and regularly bought its issues from the newsstand. Every vacation, I would lug them back home for dad. Dad couldn't afford to read much anymore because his eyesight was failing rather drastically. Anyway, I eventually switched places and landed in Ranchi. It was during my stay here that RD published a special issue in December '04 to celebrate the 50th anniversary of its Indian edition. It was a compilation of the best articles that had ever been published in it. I wanted to gift a copy to dad, who, I was sure would be delighted. I probed the newsstands in Ranchi for the collector's issue but to no avail. Crestfallen, I came back to KOlkata for my vacation, only to learn that dad was no more. The truth 'bout his mortal condition had been shrouded from me for fear of affecting my exam. My whole world had fallen apart and there wasn't much meaning in anything I did. The following month, on my way back to Ranchi ( i had 2 go there for a couple of days for registration), I came across the copy I was looking for in a bookstall in Howrah station. It was meaningless to me now, but I bought it anyway, if only to remember dad. Uncannily, though, dad had finally subscribed to RD just a month before he passed away. One tradition he didn't break away from was of subscribing under the name "Deepanjan Nag, c/o P.K.Nag." Unfortunately, he never lived to see the subscription brought to fruition. The first issue arrived in February. It was dad's gift to me. I felt inexplicably guilty. The subscription will remain a constant reminder of his deep love and affection for me. It's thru these subtle deeds that dad engrained his everlasting memory in my heart. Dad, the issues are flowing. Thanks! yes babui, i miss him too!! Haven't been reading Rd lately..but U know what? I have a RD 4 in 1 published in..get this! 1955! and I sooooooooooooooooooo treasure it!